One of the oldest and most complete skeletons of humankind's ancestors has been unveiled in South Africa. A team spent more than 20 years excavating, cleaning and putting together the skeleton of Little Foot. 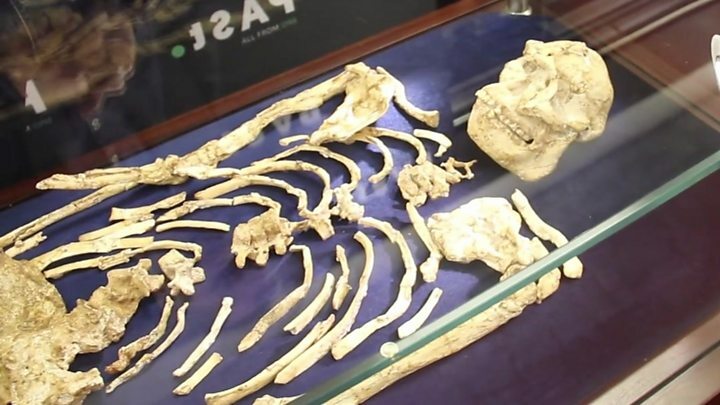 Its exact age is debated, but South African scientists say the remains are 3.67 million years old. This would mean Little Foot was alive about 500,000 years before Lucy, the famous skeleton of an ancient human relative found in Ethiopia. Both Little Foot and Lucy belong to the same genus - Australopithecus - but they are different species. Scientists believe this shows humankind's ancestors were spread across a far wider area of Africa than had previously thought. It also suggests there were a diverse number of species. It is thought that she was a young girl who fell down a shaft of one of the caves. "It might be small, but it might be very important. Because that's how it started, with one little bone. And it helps us to understand our origins," the team leader, Professor Ron Clarke, said. The process of removing the bones from the caves was painstaking, as the fossil had "very fragile bones", which were "extremely soft" and "buried in a natural concrete-like material", he added. "We used very small tools, like needles to excavate it. That's why it took so long. It was like excavating a fluffy pastry out of concrete," Prof Clarke said. The full skeleton of Little Foot, as she is known, proves that she is more like us than an ape, with shorter arms and small hands. She probably slept in trees. Quite how she fits into our family tree is still a work in progress. But she is older than Lucy, a more famous but incomplete skeleton found in far-away Ethiopia. And that means our ancient ancestors were almost certainly scattered across Africa. Scientists are used to basing their theories on tiny fossil fragments, but South Africa's caves are fast becoming a treasure trove, and helping to rewrite our understanding of how our species evolved.